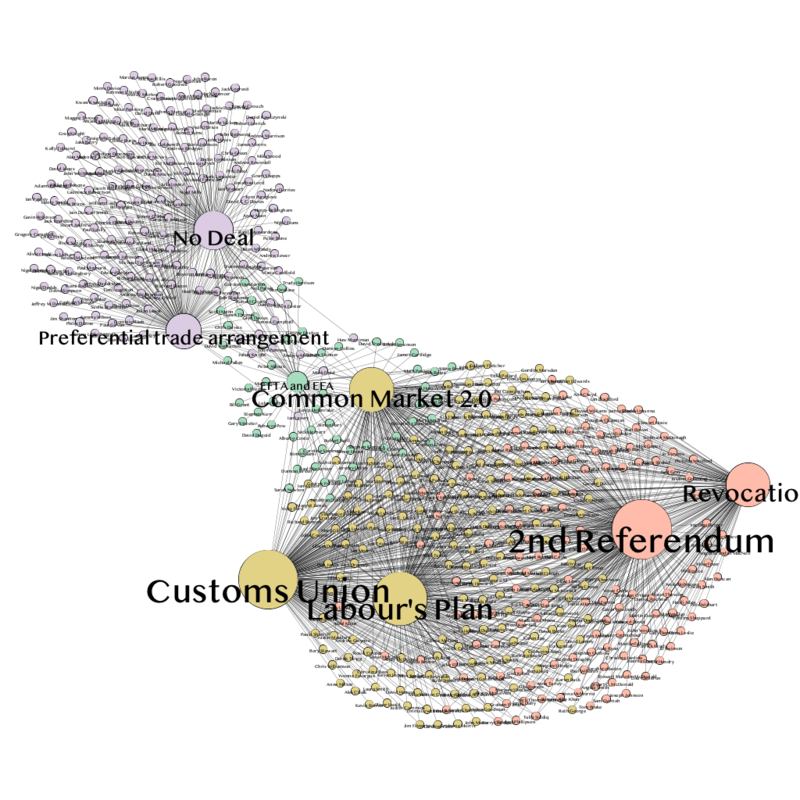 In the graph above (zoomable version here), I have mapped the votes of British MPs in the 8 options given to them on March 27 (a couple of hours ago) in indicative votes. This is a 2-mode network linking MPs and options for Brexit. The network graph shows how different options are related to each other: they are closer if a greater number of MPs have voted for them. Their size shows the number of favourable votes for each option (none of them obtained a majority. The graph show the high level of polarisation over these different options, with two clear poles: the “Hard Brexit” pole with a number of MPs for whom the only option is No Deal, or a preferential trade arrangement, and the Soft Brexit-No Brexit pole, linking the Customs Union, Labour’s Plan and a Second Referendum/Revocation of article 50. The EFTA/EEA and Common Market 2.0 options link the two poles, but there seems to be very few MPS that could be rallied in the middle. This entry was posted in Uncategorized on March 28, 2019 by alexandre afonso. Could you please share what visualization software you used to map the votes? It does not look like Palladio. Is it Gephi or something else?